Although Sister Dolores did not choose the above passage from St. Matthew as her mantra for life, her classmates and friends came to admire this very quality about her. To a person, they said she told things as they are with no frills; she was very direct. Perhaps this was an inevitable part of growing up in a large, loving family. Maria Petrita was born on April 19, 1938 in the town that bears her family name Abeytas. Her parents, Santiago and Andreita (Andrea), brought her to the church to be baptized just nine days later, on April 27th. Here Maria Petrita, who came to be known as Patsy, learned early to hold her own in the daily give and take of life. The other children in the family were Valentina (who later became Sister Angelina), Manuelita, Arthur, Isabel, Angelina, Ruben, Gregorita and Dolores. She entered the congregation September 6, 1957, receiving the Dominican habit and the name Sr. Dolores Ann of Our Lady of Belen on May 30, 1958. She kept this name until 1969 when she dropped the Ann and became known as Sister Dolores. On August 15, 1964, she made her final profession along with thirty-five classmates. After completing their year of novitiate, her class moved to the House of Studies – the first group to occupy that new building on the Aquinas College campus in Grand Rapids. Sister Dolores received a B.A. and an M.A. from Aquinas College. Continuing her education at Xavier University in New Orleans in summer courses, Sister Dolores also received a certificate in the Workshop Way® Method. 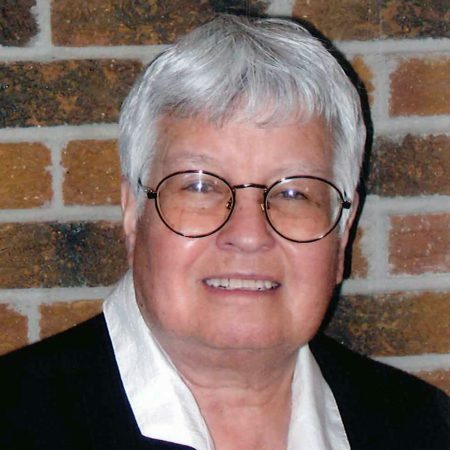 Throughout her many years as a teacher of young children in the primary grades, Sister Dolores taught in Michigan at St. Alfred, Taylor; St. Casimir, Saginaw; St. Anne, Alpena; St. Stephen, Grand Rapids and on Beaver Island. Returning to the land of her birth, Sister Dolores taught in the primary grades in New Mexico at the Nativity of the Blessed Virgin Mary, Alameda; Our Lady of Fatima, Albuquerque; Holy Cross, Santa Cruz; St. Mary, Belen and Holy Ghost School, Albuquerque. Several years later, she studied again at Xavier University, earning a certificate in Pastoral Studies in 1978. A much deserved sabbatical was spent at Wellsprings in Glen Falls, New York in 1994. Sister Dolores reflected on this time in these words: “. . . it has been a blessed year. I’ve had time to pray, play and do some work. My sabbatical program in Glen Falls, New York was a wonderful renewal program after which I enjoyed being here at Marywood for Christmas, Easter, Pentecost and all that goes on here. I took Emeritus classes (at Aquinas College) and some of the programs offered through the Spirituality Center. I even helped out with the tutoring program at St. Joseph’s (in Grand Rapids). It’s been good doing all this and visiting with family, relatives and friends back home between programs.” Following her sabbatical Sister Dolores ministered as an assistant, a receptionist and a case worker at the Diocese of El Paso Catholic Charities for the years 1995-2000. The year 2000 found Sister Dolores back in Grand Rapids where she served as Coordinator of ESL in the WORD program, a ministry funded and supported by the Grand Rapids Dominicans. Her beloved homeland of New Mexico called her again and Sister Dolores returned there to work as pastoral minister and pastoral associate at Holy Cross Parish in Santa Cruz from 2001–2008. After retiring from this position, Sister Dolores continued to live at the Adams Street House in Albuquerque assisting in many volunteer ministries and often serving as a gracious tour guide to all those who came for a visit. Sister Dolores had a heart for the most vulnerable and for those who lived in poverty. She found ways to befriend them and serve to alleviate their pain even in her later years. Those who knew her describe her as a forthright person who had a hearty laugh and genuine approach to life. She avoided the limelight while at the same time she enjoyed drawing others out by easy conversation with friends and strangers alike. Beneath the sometimes abrupt, always direct, speech, Sister Dolores was a gentle soul, truly caring about everyone. She will be greatly missed. Sister Dolores is survived by her sisters Mela Sanchez of Mesa AZ; Angelina Trujillo, Albuquerque, NM; Dolores Duran (Benjamin) of Rio Rancho, NM; sister-in-law Pauline Abeyta of Las Cruces, NM; brother-in-law Herman Baca of Albuquerque, NM; nieces and nephews, many friends and members of her Dominican Community. We commend Sister Dolores to your prayers.